One of the volunteers for GM1914 has recently transcribed this published letter, signed by the leading suffragettes and politically involved women of Manchester in 1914. Some of us wish to send you a word at this sad Christmastide though we can but speak through the press. The Christmas message sounds like mockery to a world at war, but those of us who wished and still wish for peace may surely offer a solemn greeting to such of you who feel as we do. Do not let us forget that our very anguish unites us, that we are passing together through the same experience of pain and grief. Caught in the grip of terrible Circumstance, what can we do? Tossed on this turbulent sea of human conflict, we can but moor ourselves to those calm shores whereon stand, like rocks, the eternal verities- Love, Peace, Brotherhood. We pray you to believe that come what may we hold to our faith in Peace and Goodwill between nations; while technically at emnity in obedience to our rulers, we owe allegiance to that higher law which bids us live at peace with all men. Though our sons are sent to slay each other, and our hearts are torn by the cruelty of this fate, yet through pain supreme we will be true to our common womanhood. We will let no bitterness enter into this tragedy, made sacred by the life-blood of our best, nor mar with hate the heroism of their sacrifice. Though much has been done on all sides you will, as deeply as ourselves, deplore, shall we steadily refuse to give credence to those false tales so freely told us, each of the other? We hope it will lessen your anxiety to learn we are doing our upmost to soften the lot of your civilians and war prisoners within our shores, even as we rely on your goodness of heart to do the same for ours in Germany and Austria. Do you not feel that the vast slaughter of our opposing armies is a stain on civilisation and Christianity, and that still deeper horror is aroused at the thought of those innocent victims, the countless women, children, babes, old and sick, pursued by famine, disease and death in the devastated areas, both East and West? As we saw in South Africa and the Balkan States, the brunt of modern war falls upon non-combatants, and the conscience of the world cannot bear the sight. Is it not our mission to preserve life? Do not humanity and commonsense alike prompt us to join hands with the women of neutral countries, and urge our rulers to stay further bloodshed? Relief, however colossal, can reach but few. Can we sit still and let the helpless die in their thousands, as die they must – unless we rouse ourselves in the name of Humanity to save them? There is but one way to do this. We must all urge that peace be made with appeal to Wisdom and Reason. Since in the last resort it is these which must decide the issues, can they begin too soon, if it is to save womanhood and childhood as well as the manhood of Europe. May Christmas hasten that day. Peace on Earth is gone, but by renewal of our faith that it still reigns at the heart of things, Christmas should strengthen both you and us and all womanhood to strive for its return. HELEN BRIGHT CLARK (Mrs W. CLARK). MARY TREVELYAN (Mrs CHARLES TREVELYAN). ISABELLA A. ROWNTREE (Mrs JOSHUA ROWNTREE). NORA HOBHOUSE (Mrs LEONARD HOBHOUSE). DOROTHEA HOLLINS (Sec. Fulham and Hammersmith Branch Womens Labour League). H. M. SWANWICK (Mrs SWANWICK). GERTRUDE BONE (Mrs MUIRHEAD BONE). LILLA BROCKWAY (Mrs FENNER BROCKWAY). MARGARET MOSCHELES ( Mrs FELIX MOSCHELES). ADA SALTER (Mrs ALFRED SALTER). ELINOR J. HEATON. (Mrs J. A. HEATON). MARY MOREL (Mrs E. D. MOREL). REBECCA GARNETT (Mrs WILLIAM GARNETT). FLORENCE E. HOBSON (Mrs J. A. HOBSON). HELENA HIRST (Mrs F. W. HIRST). EDITH M. H. A. BIGLAND (Mrs PERCY BIGLAND). LAURA G. ACKROYD (Sub-Editor of Inquirer). Dr. MARION PHILLIPS (Gen. 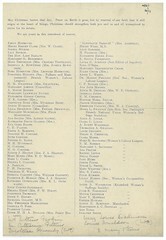 Sec., Women’s Labour League). ANNIE M. ORCHARD (Mrs W. E. ORCHARD). MARIA L. SWANSON (late Hon. Sec. Darlington Branch National Union Women’s Suffrage Societies). LILIAN HARRIS Sec. Women’s Co-operative Guild). ANNIE B. WOODHOUSE (Knutsford’s Women’s Suffrage Society). JULIE E. TOMLINSON (Knutsford’s Women’s Suffrage Society). MINNIE CHEETHAM (Knutsford’s Women’s Suffrage Society). MARY V. HOFFMAN. (Knutsford’s Women’s Suffrage Society). ESTHER HOWARD (Knutsford’s Women’s Suffrage Society). 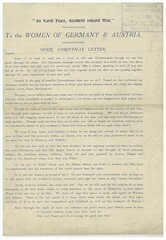 Hallo there, I came across you amazing blog, searching for the original Christmas letter from 1914. I am writing about Emily Hobhouse and would like to know whether you would please be so kind to share a copy of the original letter with me? E. Brits, Cape Town, South Afric.